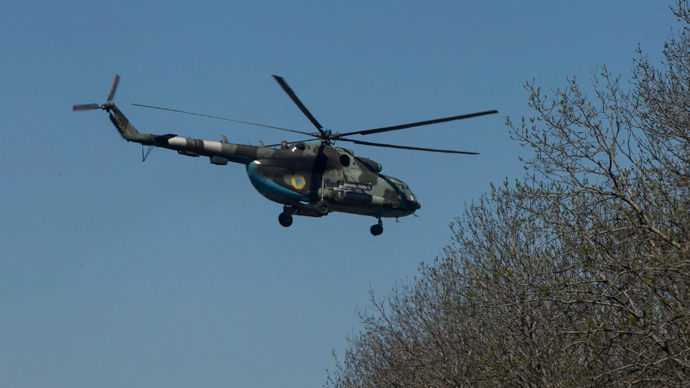 Self-defense forces have repelled an attack on a checkpoint in the city of Soledar in eastern Ukraine’s Donetsk region after gunmen landed in a helicopter and launched a blitz attack. The city is close to a depot storing millions of outdated firearms. Over a dozen of gunmen descended from the helicopter and launched an attack on a defense squad guarding a checkpoint near Soledar. 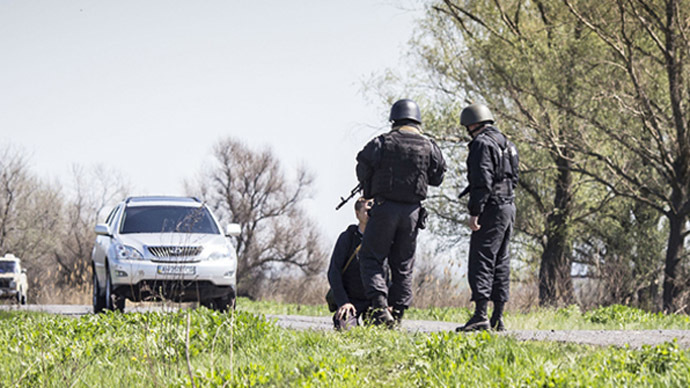 Following the shootout, the attackers have retreated as well, taking one of the defenders hostage, the local self-defense force told RT’s correspondent Paula Slier who is at the scene. The man was found on Sunday evening several miles away from the checkpoint, the activists told RIA-Novosti news agency, adding that he was “severely beaten up” and required medical attention. According to a witness who spoke to RT, a group of about six people, all armed and wearing military uniform without insignia, hid under the road sign at the entrance to the city. As a self-defense unit member, who was guarding the checkpoint territory at the time, approached them to find out what was happening, he was detained. “I was talking to him on the phone. First thing I heard was: ‘I am going to check what is there’ and then he dialed my number and all I heard was: ‘Lay down, put your hands on your head, face to the ground,’” a witness told RT. She identified the man as Igor, aged about 40. “We don’t know where he was taken, who took him or why,” the woman added. As the unknown men attacked, the militia, most of them reportedly unarmed, was forced to retreat. There are conflicting reports of deaths and injuries, with some talking about at least one killed among the attackers, while other reports suggest one of the defenders was killed. After the military raid ended, some of the self-defence militia moved forward to retake the checkpoint. Those who were guarding the checkpoint, told Slier that the marked attackers in black uniforms were armed with ‘US-made guns’. A short distance away from the checkpoint there is a salt mine and an army warehouse and a Ukrainian army barracks. A group of several hundred people have gathered near the warehouse, almost forming a human chain to prevent arms from being looted, Paula Slier reports. 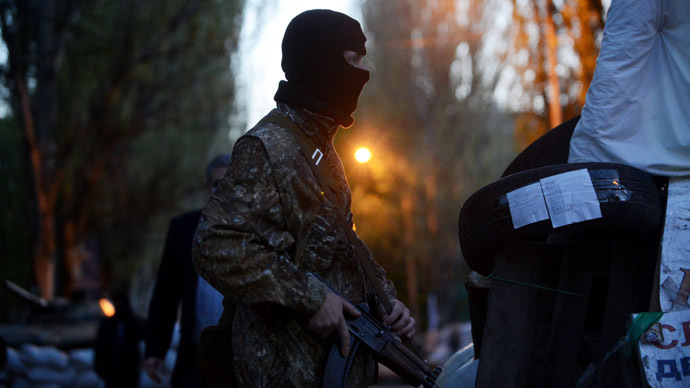 The civilians blocked the firearms warehouse to prevent a possible takeover by the National Guard forces, a militia source told RIA Novosti previously. Ukraine’s National Guard was formed by the new authorities in Kiev in the wake of the coup, incorporating many of the radical activists, who took part in clashes with the police during the anti-government protests in February. He added that the warehouses were left over from Soviet times and have in storage only outdated weaponry, such as Mauser, Colt, Degtyarev machine guns, submachine PCA guns but in great amounts. Kiev authorities are carrying out a military operation against anti-government militia supporting the federalization of Ukraine in the eastern part of the country. Kiev said on Friday that “the second stage” of the military operation in Slavyansk has been launched. Slavyansk is in the control of people’s self-defense forces that are defending the city, repelling the attack of the Kiev military. Kiev said on Friday that “the second stage” of the military operation in Slavyansk has been launched. 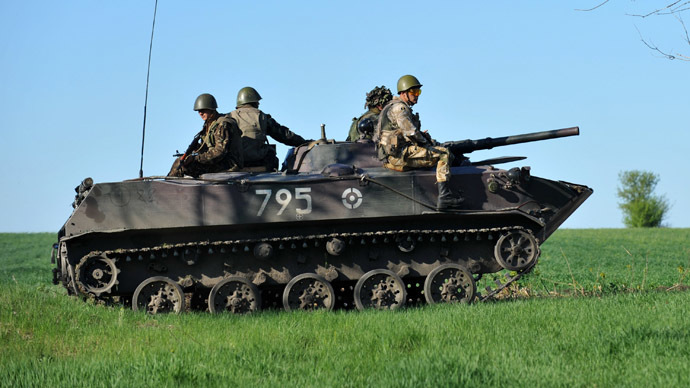 Slavyansk is under thecontrol of people’s self-defense forces that are defending against the Ukrainian armed forces that have set up a military base some 20 kilometers from Slavyansk, RT's stringer, Ukraine-based British journalist Graham Phillips reported on Friday. “The aim is to completely isolate Slavyansk to localize the problem,” the coup-appointed acting head of presidential administration Sergey Pashinsky told media on Friday as cited by RIA. On Thursday, five self-defense members were reportedly killed and one injured in a gunfight in Slavyansk in a night attack on a militia checkpoint on the outskirts of the city. The incident happened as Kiev authorities sent tanks and armored vehicles against the local population. In response to the escalation of violence in eastern Ukraine, Russian President Vladimir Putin slammed Kiev on Thursday saying that the use military force against the civilian population is a serious crime which makes Kiev authorities a “junta”. Russia’s UN envoy Vitaly Churkin pointed out in an interview to Rossiya 1 channel on Friday that if the violence in the southeast of Ukraine doesn't stop, Russia will call a special session of the UN Security Council.